"Cobblestone Mill is a symbol of the natural abundance. The mill wheel will turn for as long as the stream that powers it will flow, grinding the flour that sustains a simple, satisfying village life. The mill stands alone, yet it is enlivened by a dazzling play of light and shade that falls on it from the flowering woods that embrace it's solitude. "Its dignity is enhanced by the dance of color that so delights the eye. Beauty — and all else that is good — is a gift of light, bestowed by the sun, which also grows the grain that will be ground in this millstone. "Cobblestone Mill reminds us that all blessings flow timelessly from the hand of God." 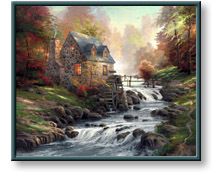 Cobblestone Mill copyright© 2002 by Thomas Kinkade is prohibited from being copied.